Preggie Pops Drops Discounts Apply ! 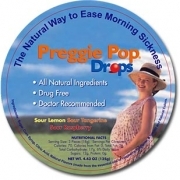 A natural and effective remedy for morning sickness in the convenience of a drop. Flavors include Sour Lemon, Sour Tangerine, and Sour Raspberry. Each box contains approximately 21 drops.